How many times have you heard the complaint, ‘you’re not listening?’ Back in school, we would all let our minds wander, and often get caught by the teacher. At home, we would often think of other things when our parents departed valuable information and wisdom. Later on, in personal relationships, we would be accused of mot listening again. The funny thing is, as we grow up, we actually start to listen. We know by now that pretending to listen doesn’t pay off; the vacant stare and the lolling mouth usually give us away. And yet, if we think carefully, we often don’t really listen; we are merely hearing words and sentences, neither internalizing them nor acting on them. This habit of not really listening can cost us dearly, losing respect and reliability in jobs and personal relationships. 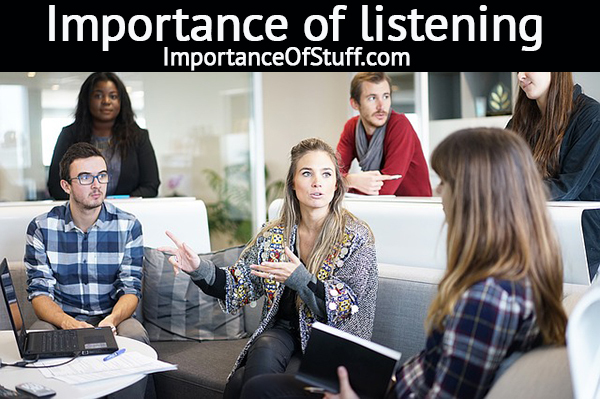 It is not for nothing that listening skills are listed as one of the most desired attributes in a person. Here, let us see why. It goes without saying that paying attention in class is crucial to becoming a good student. Textbooks contain a lot of information, but it is through listening that we actually become better academic performers. Listening carefully to what is being presented and explained in a classroom helps in better understanding; besides, the audio visual mode of leaning, which we get in a classroom scenario, has been proven to be the best method of learning. This way, if you pay enough attention in class, you will remember the points better. Not listening in class will make you lose out on points being discussed, important dates and notifications, and reduce participation in class. People who speak too much and too often tend to speak without thinking, and often without listening. For that reason, very little of what they say hold any weight. When you are a careful listener, you get to pay attention to details, and are therefore much better equipped to handle situations. You don’t miss out on important details, and so, when you do chip in with your own two cents, it’s worth listening to. You are able to understand things better and in greater detail, simply because you are so used to keeping your ears and your eyes open at all times. Good listening skill is listed as one of the topmost criterion in a profile, and it is getting ever more important in the present day and age. With workforce becoming more competitive, you need to prove your worth every single day. And how can you do that? By being different, and more productive, of course. And listening attentively is the key to being an efficient employee. When you listen carefully, you learn instructions, and you become the kind of employee who follows through every time. Because you are attentive, the chances of making mistakes are minimized, and you naturally become a valued part of the workforce. Because you are known as the thinker, employers turn to you for advice, and this attribute makes you a great team leader. Having superior listening skills does not only make you a great employee, it makes you a great person outside of work as well. You are attentive to detail, which means you never forget a single important date, and you can always be relied upon to carry out every plan among friends and family. You listen carefully without interrupting to add your own bit, which makes you a great shoulder to cry on. People come to rely on you and trust you on every small matter. Being in a relationship with you is all the more satisfying because you really know what the other person is thinking and what every action means, because if the topic has come up in any conversation, you have certainly listened to it. Good listening skills make you empathetic and trustworthy, and people turn to you when they need advice or simply need some support during hard times. You never try to impose your own opinions without listening to the whole story first, and because of your nature, people listen to you in turn. It is important to learn to listen. If we do not listen carefully, we lose out. We miss out important notes being given in lectures, miss important details that could make or break our career, and fund ourselves unable to hold on to a steady, fulfilling relationship. It’s true that not all of us are born with listening skills, but there is no reason why we should not be able to learn. Although not everything that is being told would be of interest to us, it is still not especially difficult to learn to sometimes listen just to make the other person feel better.